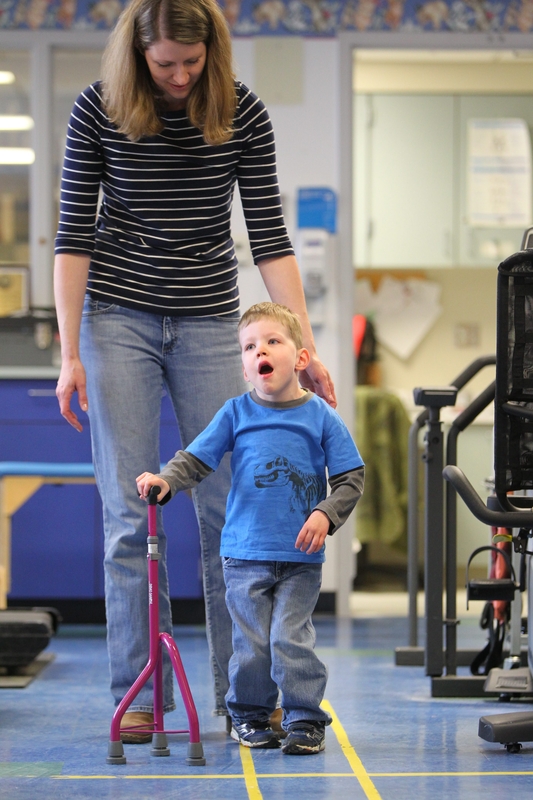 Austin Collier, 3 years old, works on walking with his mother Stephanie Collier, back, and physical therapist Dawn Shaflucas, not shown, at the Robert Warner Rehab Center in Women and Children’s hospital in Buffalo Tuesday, April 15, 2014. After Austin Collier was born, doctors warned his parents that it would be hard for him to overcome the challenges he would face after oxygen and blood were disrupted while he was in the womb. There was a chance, they said, that he might never recognize them. One kidney atrophied, the part of his brain in charge of making muscles move was damaged, and he developed the “spastic” kind of cerebral palsy that would interfere with walking and moving his left arm and hand. Austin was so sick the day after he was born that he was transferred to the care of the specialists at Women & Children’s Hospital. “And that’s what we did,” said his mother, Stephanie Collier. Now 3½, Austin is a surprise. He chases the dog wheeling around in his walker or crawling. He greets the neighbors from his special tricycle. He loves Dr. Seuss stories, spells his name with slow precision and works hard at physical therapy. On a recent afternoon in the seventh-floor pediatric physical therapy gym at Children’s, Austin kept practicing his backward walk even after his session on the treadmill was over. To help Austin compensate for the misfired brain signals of cerebral palsy, Collier takes him to a different kind of therapy almost every day: swimming, horseback riding, speech therapy. After Austin was born, his mother resigned from her job as technical writer for a biomedical company and applied herself to studying how she could help her son overcome his obstacles. To help train his muscles, Austin wears a suit made of neoprene and elastic underneath his clothes that helps him align his body, straighten his legs and adjust his gait. Since his feet tend to collapse inward, ankle braces made of hard plastic help support him so he can walk while holding someone’s hand. Collier also founded a support group, Connected Parents, for parents and caregivers of children with cerebral palsy. Someone who came to one of the Connected Parents meetings led her to a therapist who used a novel technique, called PROMPT, to help Austin move his mouth and learn to talk even after another therapist told her not to count on much. All the attention and support, including help from family and friends, has led to what she calls overwhelming success. When one of his new doctors met Austin for the first time, he didn’t think he had the right kid because he had expected less after reading the boy’s medical history. “Everybody’s surprised at what he does,” Collier said. Austin’s father, Arnold Collier, who used to play hockey and baseball, said he felt disappointed at first when doctors said his son wouldn’t be able to play contact sports with only one working kidney. When Austin’s problems turned out to be more complicated, Arnold’s hopes simplified. He particularly likes the page that shows the family throwing food after the boy asks for a food fight. The Colliers, both 31, say working with their son has made them more patient. “Everything takes a little bit longer, but he’ll get there,” said Arnold. As the family headed out the hospital door, Austin turned around in his stroller and, as if to prove his father’s point, blew a kiss.